When you hear the phrase, “the Kennedy assassination,” your mind automatically jumps to Dealey Plaza in Dallas, home of the Texas School Book Depository and workplace of a mousy little communist named Lee Harvey Oswald. Given the outsized place that the death of John F. Kennedy holds in American history, it is not surprising that the assassination of his brother Robert Kennedy is all but forgotten. For those of you who, like me, are not well acquainted with the murder of RFK, a new podcast provides a fascinating look at the crime, the criminal and the possibility of a conspiracy. The podcast is called the “RFK Tapes” and features an investigation by Zac Stuart Pontier and Bill Klaber into the assassination of JFK’s younger brother. On June 5, 1968, Robert Kennedy, who had served as JFK’s attorney general, was the junior senator from New York and he seemed to be on top of the world. That day he clinched the Democratic nomination for president with twin primary victories in California and South Dakota. Afterward, he went to a celebration at the Ambassador Hotel in Los Angeles. A few hours later, he was dead. The assassin was Sirhan Sirhan, a Palestinian Arab who was born in Jerusalem to a Christian family. 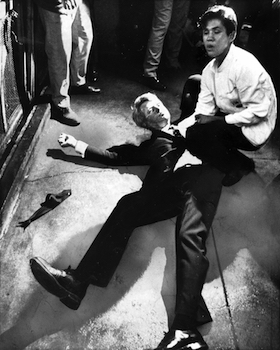 Sirhan was a Jordanian citizen who had come to the US with his family as a child, 12 years before he killed Kennedy. He spent his early years in the West Bank where he was traumatized by violence, including the death of his older brother, from the Arab-Israeli wars. His early years left Sirhan with a deep dislike for Israel that became a motive for the assassination. There is little doubt that Sirhan was involved in the assassination. Witnesses saw him fire his .22 pistol at Kennedy in the kitchen of the Ambassador Hotel. He was apprehended at the scene by onlookers, who disarmed him after he had emptied his gun. A journal was found at his house where Sirhan had written that “RFK must die” because of his support for Israel. Sirhan even confessed to the police after his arrest and asked to plead guilty to the murder. Similar to the assassination of JFK, the question became whether Sirhan was the sole perpetrator or whether there was a conspiracy. The main evidence for a conspiracy is the possibility that more than eight bullets were fired during the melee in the hotel kitchen when Sirhan’s gun only had an eight-round capacity. There is also the mysterious “girl in the polka dot dress” who several witnesses claim to have seen. Finally, there are questions about ballistics such as whether Sirhan was close enough to account for powder burns on Kennedy’s body and whether the angle of bullet entry matches Sirhan’s position in the kitchen. Some episodes of the podcast present seemingly bizarre theories, such as the idea that Sirhan was the victim of hypnosis and mind control. Proponents of this theory argue that it explains why Sirhan today claims that he cannot remember the killing. Sirhan boosted this theory in 2011 when he claimed that the “girl in the polka dot dress” triggered a posthypnotic suggestion that made him draw his pistol and begin firing. The podcast investigates the evidence both for an against a conspiracy and presents an objectively to the listener. In the wake of Christine Blasey Ford’s testimony about Justice Brett Kavanaugh, it is interesting to see how eyewitness testimony changes over the years. When a story changes over the course of 30 or 50 years, is it because memories are not perfect and our minds play tricks or is there a more sinister reason? Especially after several decades, eyewitness testimony cannot be considered reliable without supporting evidence. Although I remain a skeptic, I have to admit that the evidence for a conspiracy in the RFK assassination is more compelling than it is in the case of JFK. On the question of how many bullets were fired, we will never know the truth for sure because the LAPD destroyed key evidence that may – or may not – have proved that there were two guns. More than eight bullets would be de facto proof of a conspiracy. Also curious is the way that the LAPD discarded the reports of the “girl in the polka dot dress.” Featured in the podcast are audio recordings of LAPD Sgt. Hank Hernandez browbeating witnesses into recanting their claims of seeing the girl. One is left with the feeling that Hernandez was less interested in finding the truth than in eliminating loose ends. Whether you’re a skeptic or a true believer, the “RFK Tapes” is a gripping look back at a pivotal time in American history. If Kennedy had lived to become the Democratic nominee, Richard Nixon might never have become president and the latter three decades of the 20th century might look entirely different. As with the death of JFK, it is humbling to think that the course of history could turn on the actions of a single aggrieved gunman. As Rand Paul recently warned, it could easily happen in the current political environment as well.